The duelling races of the Tellius continent have finally found a wary peace after centuries of war. But a new evil threatens to tear the fragile truce. Ike and the Greil Mercenaries must travel Tellius to bring an end to King Ashnard's evil designs. Each chapter presents you with a map divided into a grid and a mission to complete, such as protecting a character or defeating enemy forces. 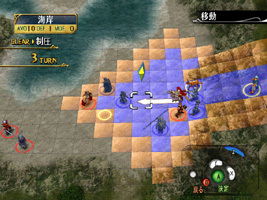 Each turn, you move your army around the map, visiting buildings or talking to other players. Weapons and magic can be used to gain an advantage over certain kinds of enemy. If a member of your forces is defeated they remain so for the rest of the game, but if Ike falls then you must restart the map.